Visionary, proto-modernist, and futurist are just some of the terms that have been used to describe the extraordinary British designer Christopher Dresser (1834-1904). As the head of a busy studio, Dresser directed the production of thousands of designs in practically every medium. A prolific and innovative designer himself, Dresser drew on his botanical training and gathered sources from around the globe and across centuries. In combination, these diverse inspirations resulted in an amazing array of unique and highly original designs. As a design theorist, Dresser pioneered the idea of a partnership between designer and manufacturer. He embraced the machine age and would ultimately come to be recognized as a pivotal figure in the history of industrial design. Our collection borrows its name from Christopher Dresser's 1886 pattern book Modern Ornamentation and contains designs that span his long career. 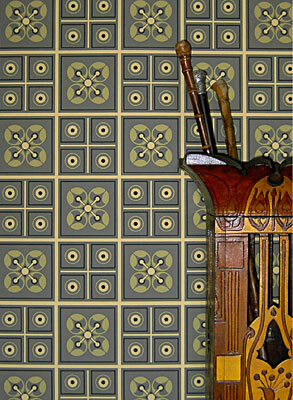 These patterns appear as fresh and striking today as they did over a century ago. All site contents © Copyright 2005-2018 Mason and Wolf Wallpaper :: All rights reserved.